This post was written by Emma Gilpin, a third-year French and German student at Oriel College. One of the most important elements of a modern languages degree is the year abroad. It’s not something you are generally thinking about when you’re first applying to university and it’s all so far into the future but it certainly comes around quickly! 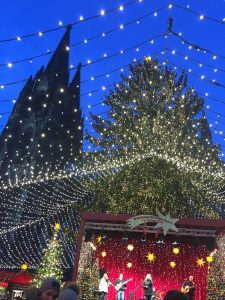 I am a third-year student of French and German at Oriel and I am currently on my year abroad, working as a languages assistant in Cologne, Germany. Lots of people choose to be languages assistants when they are planning their year abroad because, honestly, it’s such a great option! There are lots of possibilities available when you start planning how you want to spend the third year of your course, especially if you are studying two languages. I personally thought it would be great to be a languages assistant in Germany for 6 months as it would leave me plenty of time to spend in France later in the year (writing lots of CVs and job applications turned out to be a great way to keep up with my French!) I also wanted to spend a little more time in Germany as I have always found German a bit more difficult than French, but I have improved lots and am now hoping I still remember how to speak French! The great thing about the year abroad is that you have so much freedom to choose what you want to do, whether you want to be studying or working, as well as the freedom to live where you want to, travel, meet new people and learn new skills. At times, it can be hard being away from home but there is plenty to keep me busy. Working in a school is a lot of fun and I often feel like I am learning as much from the students as they are learning from me! 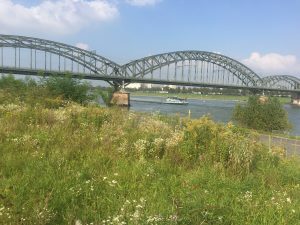 Not having to work on weekends is also a revelation after 2 years studying at Oxford so I have enjoyed exploring Cologne, travelling to new places and making sure never to miss out on opportunities to try new food (it’s all part of the cultural experience). I feel really grateful to have this opportunity as part of my degree (how cool is it that chatting to my flatmates basically counts as work here?) and have not only learned lots of German but other skills too, like how to find a flat to live in for 6 months, how to navigate the tram system in a foreign country and how to teach a class of rowdy year 8s about a topic I’ve never read about- I’m hoping finals will be a breeze after that!